Golf Club At Wentz Com Villas #2 Bldg. Wentzville is a city located in St. Charles County, Missouri. It has a population of 29,070 residents and rests on 19.96 square miles of land. Wentzville is located in the beautiful state of Missouri; America’s Heartland. Residents love that it’s less than an hour’s drive from the large city of St. Louis, making visiting the large city easy and convenient. The town grew from only 5,000 residents in 1990 to an outstanding 29,070 residents by the year 2010. Even though the city is growing rapidly, you will find that it still has the charm of a small town. There are many friendly neighborhoods in the city and this is the perfect place for families. There are many homes in the area, ranging in sizes and styles. Single family homes are the most popular among residents but there are other options for those looking for something different. Residents enjoy access to shopping, dining, entertainment, and outdoor recreation. The median list price per square foot is $105 and this is higher than St. Louis Metro’s median of $104. If you are interested in purchasing a home in Wentzville, contact us today for more information. When you're searching for that perfect place to living in Wentzville, try using some of these hints to make your search easier! 1. 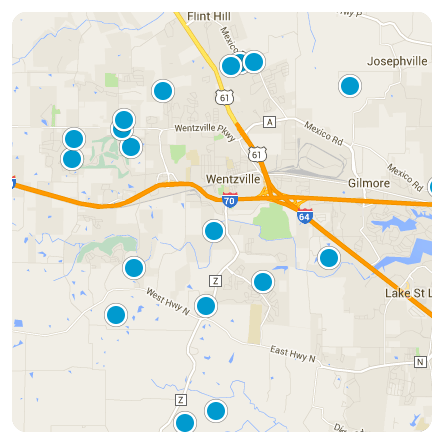 There are lots of opportunities for New Construction in Wentzville. Try the search below to search for New Construction homes, as listed on the MLS. Not all new construction is listed on the MLS, so be sure to contact us about new subdivisions being developed by the local builders. 2. Parts of Wentzville are considered rural under USDA guidelines. Try this search below for Wentzville homes that are located in a USDA-loan eligible area (as reported by the listing agent). For a more accurate search and more information, please contact us to assist you with the USDA program. Ask us to help you with names of subdivisions that may have homes that fit your needs!